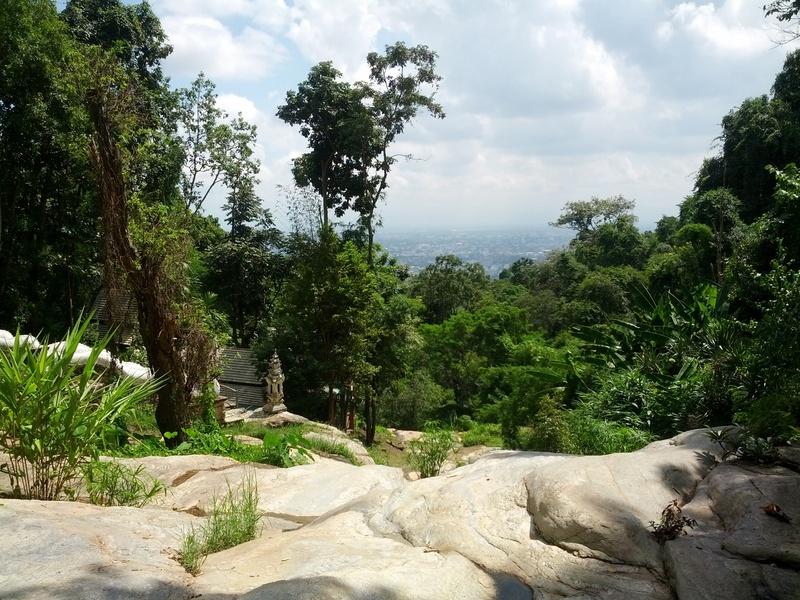 It’s not exactly a rock and a hard place, but when it comes to my 40-something self living in Chiang Mai , I am definitely caught between a backpacker and an expat. I am a bit of an odd demographic here. There is a bountiful farang (the Thai word for foreigner) community and culture here with a bevy of condos blossoming to prove it. For the most part you have your young 20-something backpackers, exploring the world post-college. Some of them are here teaching English, others just passing through. Then you have your expat community — retirees from western cultures around the globe here to make the most out of their retirement money and experience. 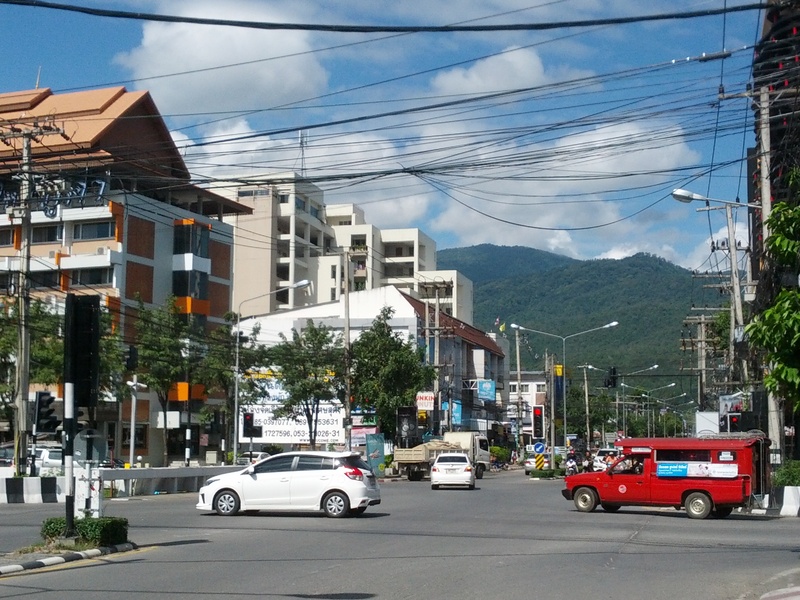 Some expats have lived in Chiang Mai for decades, before the injection of western culture and increased tourism giving rise to cars and condos, traffic and pollution. And then there’s me. The 40-something. 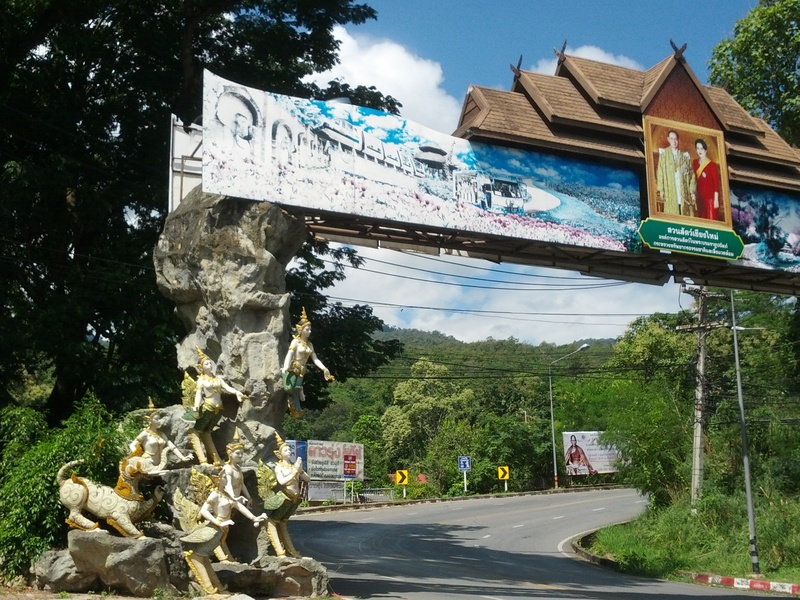 I am somewhat of a novelty here amongst farangs in Chiang Mai. 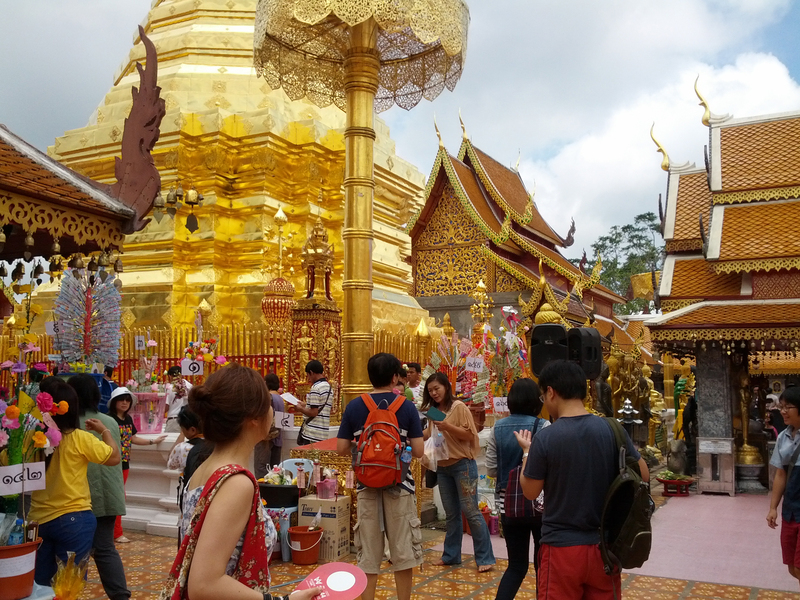 Generally speaking, 40 somethings aren’t out roaming the globe and, for the most part, they aren’t living in Chiang Mai. They are perhaps at home with their families, or mid-career building towards retirement – at which point maybe they will retire in Chiang Mai. But not me. Here I am nearing my fifth year of international living. And with all its bounty and blessings, undoubtedly I face my times of discouragement, loneliness, and feeling disconnected. 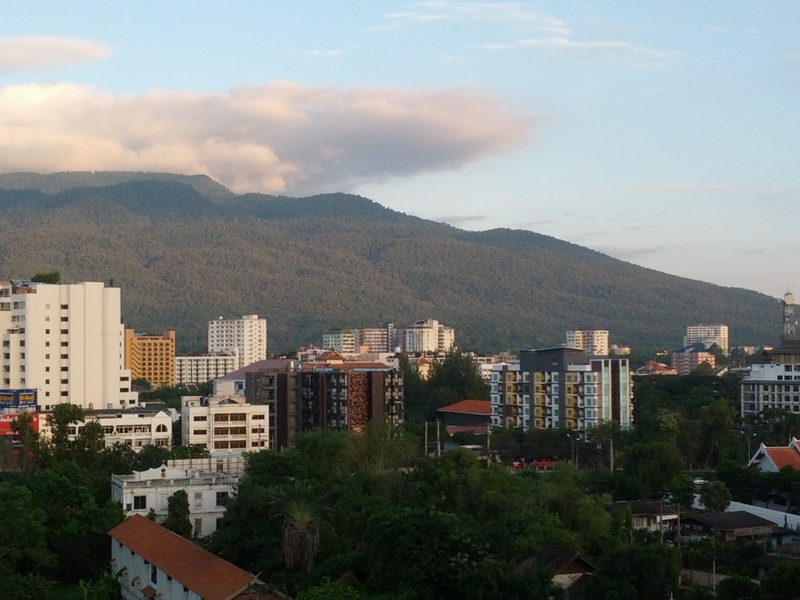 But today I am sitting in a lovely studio condo, on a comfy bed dressed in white sheets and comforter with the coolish air and light coming in as the mountains of Chiang Mai are outstretched before me. I am on just a bit of a break. A brief escape to the other side of town and a venture away from my regular room and life on the campus where I live and work. Just this little bit of time and space is… restoring. 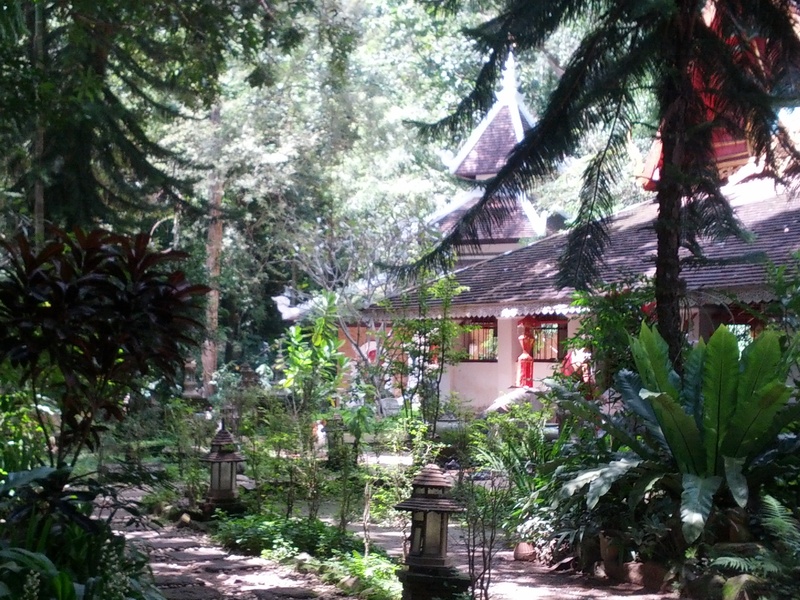 This small slice of privacy and comfort in the midst of the bustle of Chiang Mai’s Nimmanhaemin Road and the mountains just outside my window is, well, at least a bit of the pleasure of this journey and an earnest delight. As I explore this area of town I continue to wander around on foot, one of the few doing so in the city. It is not a walking community. 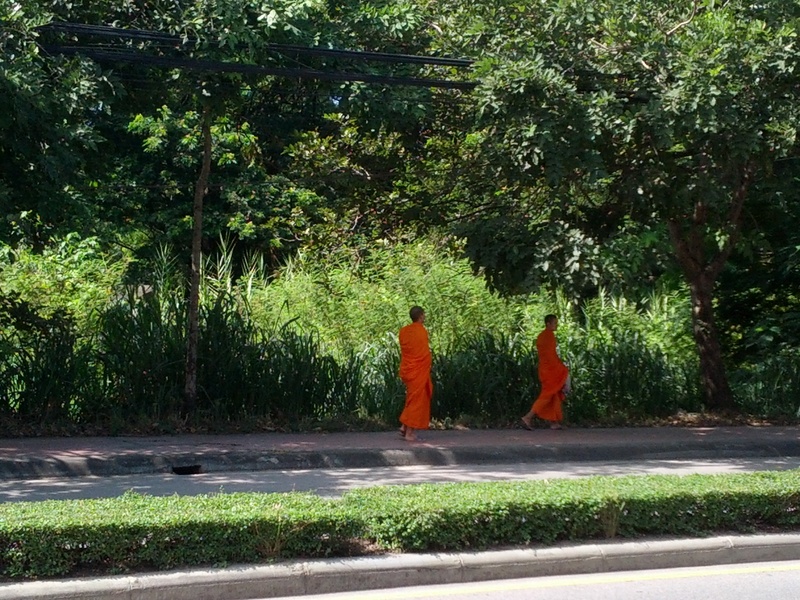 The only other company I tend to have in my walking ways are periodic tourists and the monks, found in abundance here dressed in orange robes, occasionally making their way from one place to the next. At least part of the reason no one walks here is because… it’s really hot. The other day I was at the bank, not a far stretch away from where I live. I accidentally forgot my wallet and had to leave, walk home and walk back only to return sweaty and steamy from the reasonably short journey. It may not seem that hot out for the day, but when you actually begin to move… that’s when the reality of the heat sets in. I choose not to ride a motor bike for now in part for safety reasons. But the truth is, walking is not a guarantee either. Sidewalks are either non-existent or mostly occupied by street vendors of all shapes and sizes. It’s not unusual to have to weave through dips, cracks and potholes or walk along the side of the road cautiously sharing space with the motorbikes buzzing by. Of course being here is not without it’s charms. 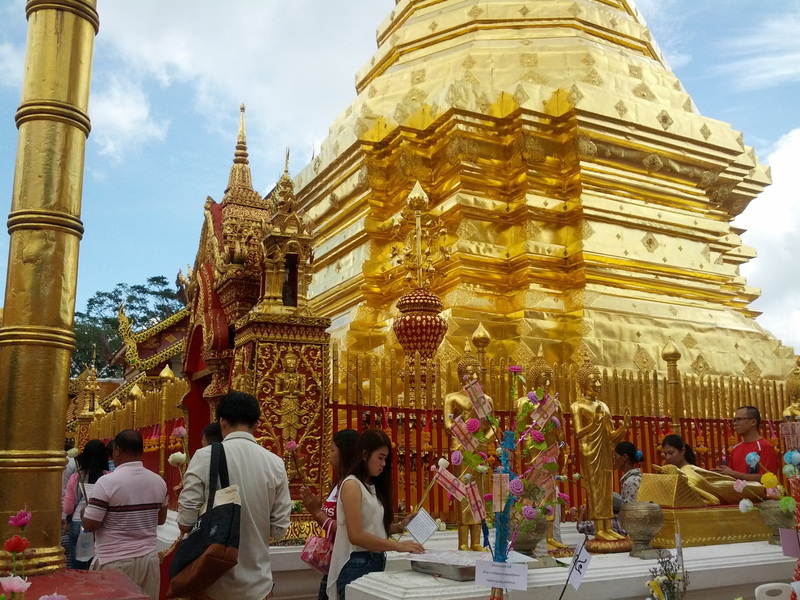 Not long ago I joined a meet-up group and we headed up to the near-by and much beloved Doi-Suthep mountain to its revered temple, Wat Phra That Doi Suthep. 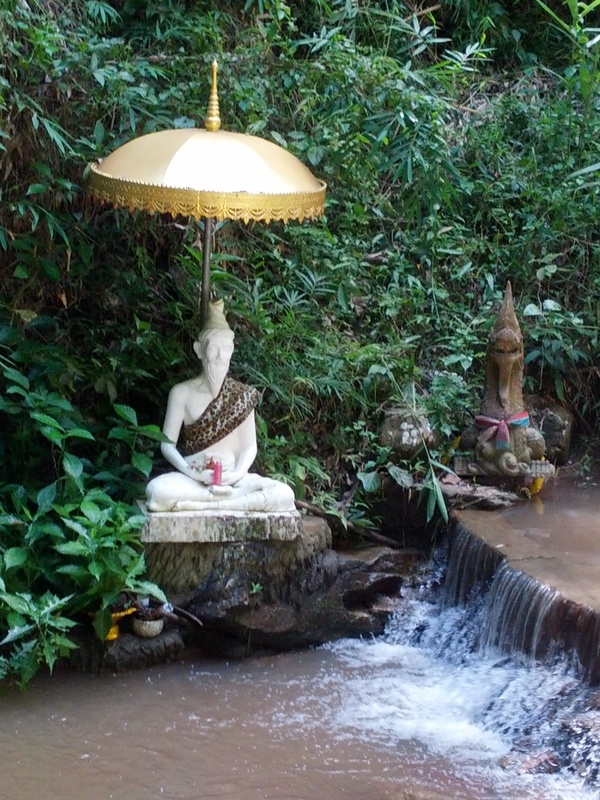 Historically and even today folks pilgrimage on foot up the mountain, passing through the 5 stages of enlightenment along the way. We, however, took the accelerated route and cruised comfortably in an air-conditioned Honda sedan. As a regular traveler in the back of songthaews and tuk tuks, I have a new appreciation for the modern automobile with its little luxuries like seat belts and was grateful for the ride. 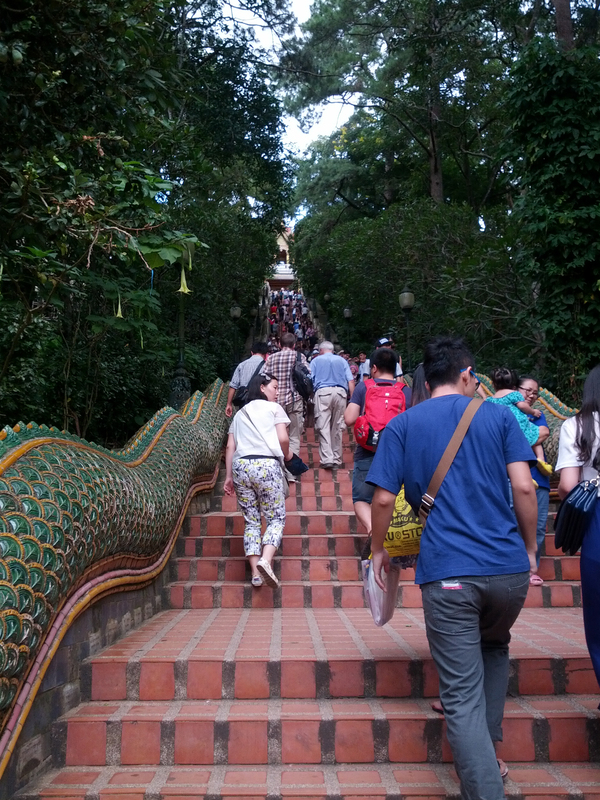 We skipped past a few stages of enlightenment, hitting only the highlights, and without breaking a sweat we arrived at the end of our journey, Wat Phra That Doi Suthep. We arrived initially greeted by the entourage of vendors selling their foods, crafts and wares to interested tourists. Before entering I had to rent a skirt as I forgot and wore shorts, which is not acceptable when visiting the temples. We took a quick walk in and I was… enchanted and appreciative of being there. Gold and bounty and beauty. Reverence and something honorable, pristine and truly lovely… even amidst of the bustle of the crowd. 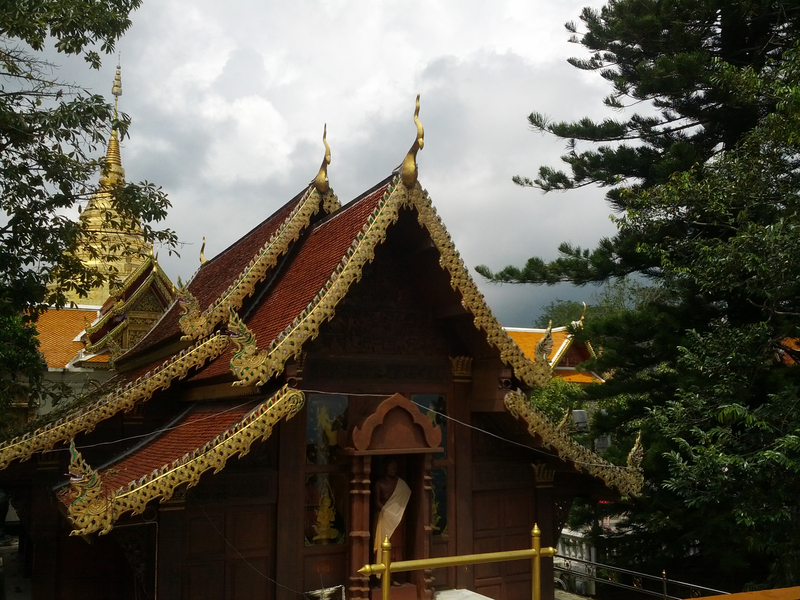 We wandered around the inside of the temple. I took a moment to get a blessing from one of the monks as he tied a string around my wrist like a bracelet. 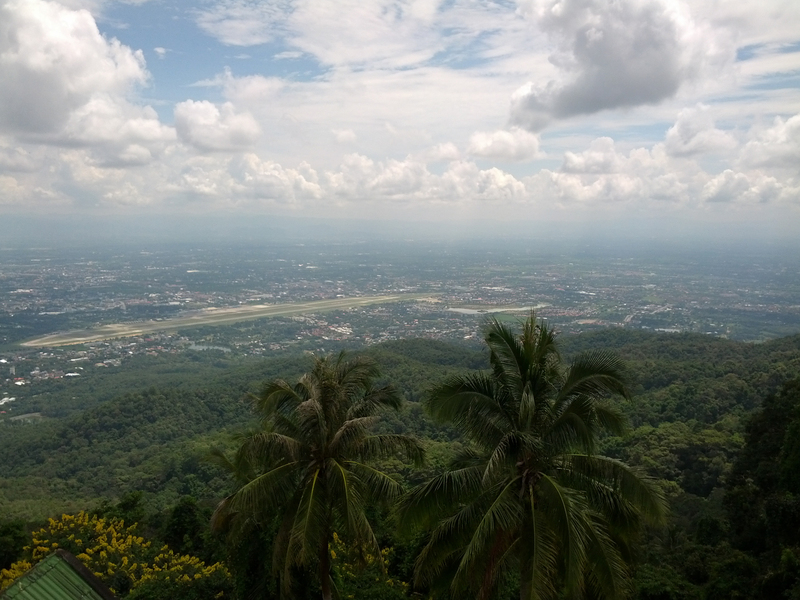 We took in the scenery overlooking Chiang Mai. Soon it was time to leave and we quickly shuffled back down the mountain and enjoyed lunch together. 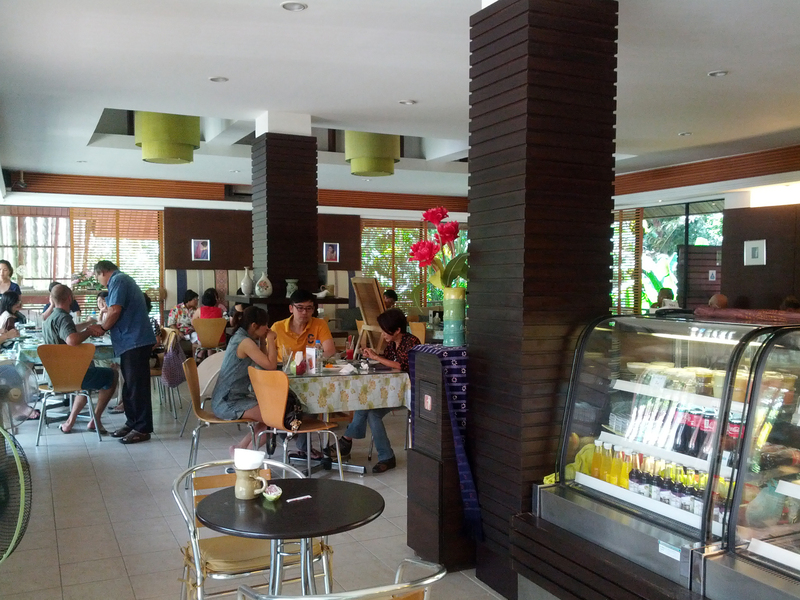 I was thrilled at our lunch location which was The Royal Project Restaurant. The Royal Project is the monarchy’s special collection of organic food and product, sold in select stores and used to prepare food for the restaurant. 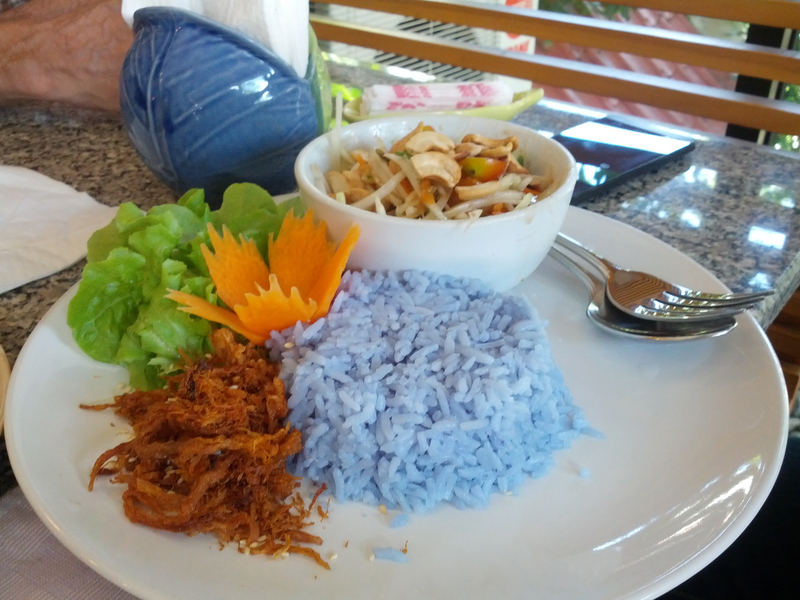 I always appreciate quality food and with the help of my Thai host was able to order a healthy meal that worked for me. We also took a quick peek in the on-site market featuring Royal Project products. I purchased just a few things including Butterfly Pea Tea made from a local flower. When brewed it is a dark purple and our host said he drinks it every day for his health. Dining at the Royal Project. I have just a few more days of break before returning to school and work next week. 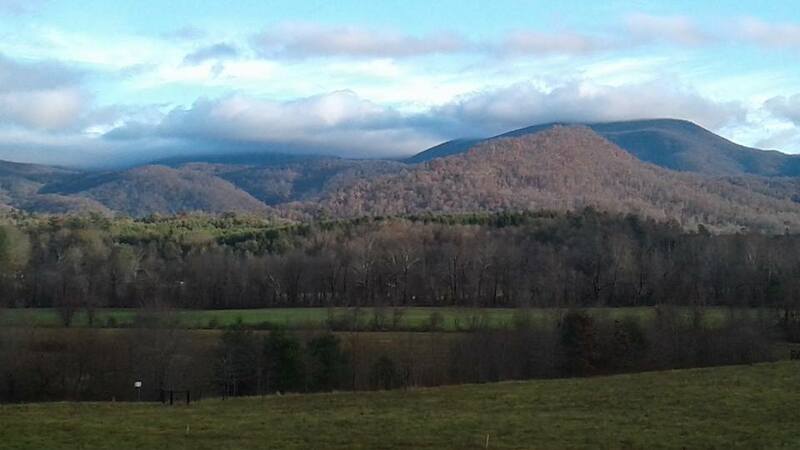 I am doing my best to soak up the rest and relaxation, the mountains and the quite before resubmerged in the land of 6,000+ students. How about you? Backpackers, retirees and in-betweeners alike, what stories do you have to tell? It’s always good to hear from you! Good-bye for now from my mountain-side mini-break!